So, we headed into Reikorangi Valley and followed Mangaone South Road, where the southern end of the Mangaone Walkway is accessed. The last time we had explored this track (when my son was about two), we only got as far as the swing bridge (50 metres in), before becoming ensconced by the river, experimenting with the myriad different ways stones can be thrown into the water (<– irony). So no actual bush-walking was undertaken on that occasion. This time, on our way to the walkway, I was struck by the landscape to the south of Mangaone South Road, where the Waikanae River meanders along the valley floor after leaving the hills only a few kilometres north [click here to view map]. 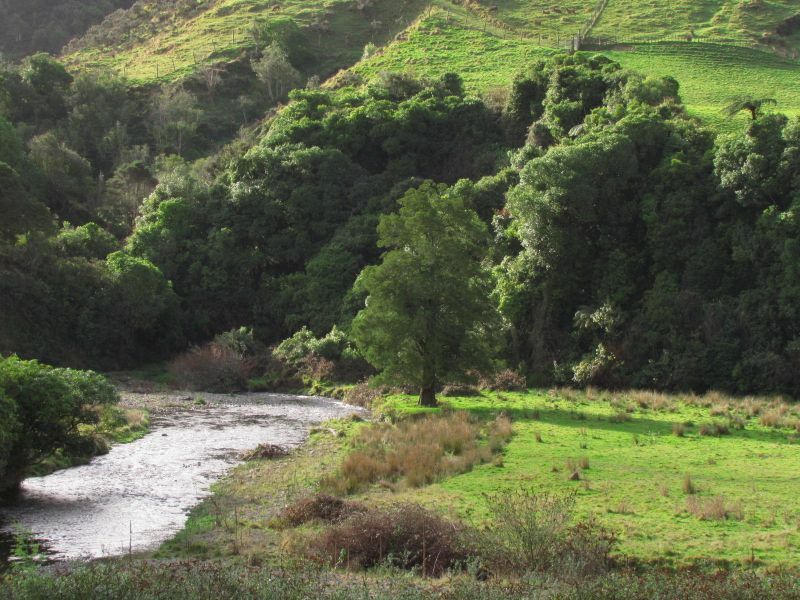 To one side of the river was a solitary kahikatea – no doubt one of many which would have stood on the river flats when the valley was still in forest. Though still relatively early, the winter sun was sinking behind the valley creating a diffused misty light and casting shadows in the contours of the hills. We also managed to walk some of the track, which follows the route of the old bush tram used when the podocarp forest was milled from the late 19th century. Clearings along the track suggest places where mill machinery or perhaps makeshift buildings once stood. Today, the forest is regenerating: most of the canopy trees were cut out for timber, but eventually a new canopy will form of rimu, rata, kahikatea, matai, and miro. Even so, it was an enchanting walk: many rivulets and streams create waterfalls as they fall down the steep valley into the river below, and moss-covered rocks and logs along the track are testament to the abundance of water. Ferns are prominent, the forest boasts five different tree fern species, as well as a diversity of ferns on the ground and growing up tree trunks. Sadly, the forest was eerily quiet – we did not hear a single bird call while in the reserve, and though this is not unusual in New Zealand forests, it is particularly lamentable given the area’s history as the last refuge of the huia. Perhaps during my son’s lifetime this will change, though I suspect not without concerted and sustained effort. Photo top and centre: The river and valley from Mangaone South Road. Above left: one of the many bridges along the track. 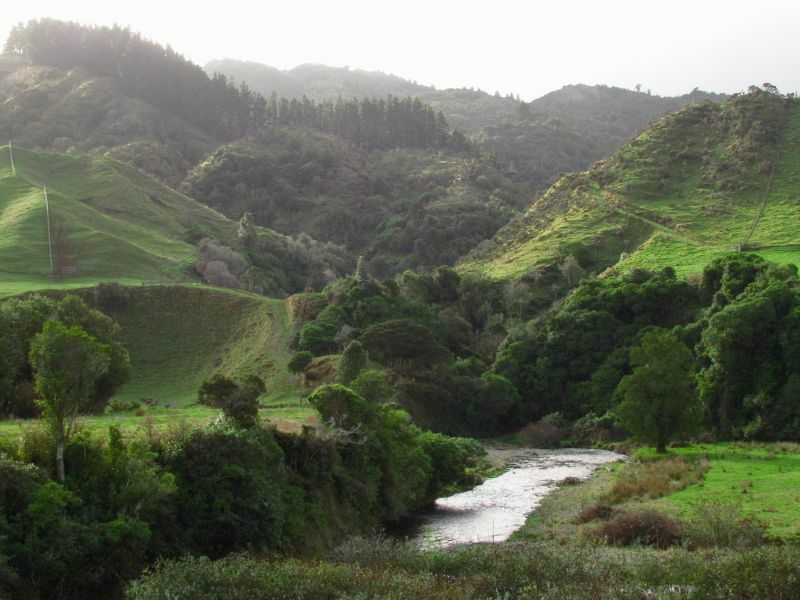 See also: Views of Kapiti 6 – Reikorangi farmscape; Akatarawa Valley – last refuge of the huia. The real problem is possum control! The Reikorangi Basin is the one area between Wellington and the northern end of the Tararuas that is not targeted with 1080 by DoC or Regional Council. 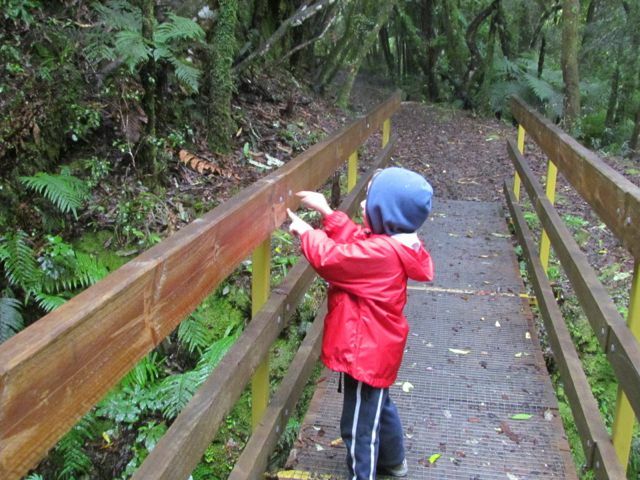 The Regional Council uses 1080 on the Regional Forest Park on the Akatarawa Side, and DoC has a 1080 programme for the rest of the Tararuas every seven years or so. One thing is that now possum fur is getting $130/kg there is active interest in trapping possums up in the valley. Thanks for your comment, Anon. I suspected the silence was probably due to the use (or not) of possum control, but it is good to have that confirmed. It is a salutary example of how much damage these critters do.